We are delighted to report that the students, staff and parents of Waldegrave School, along with the help of Mrs Bassett and the students from Teddington School, and Mrs Marker and the students from The Richmond upon Thames School, have successfully completed five massive quilts as part of The 70,273 Project. 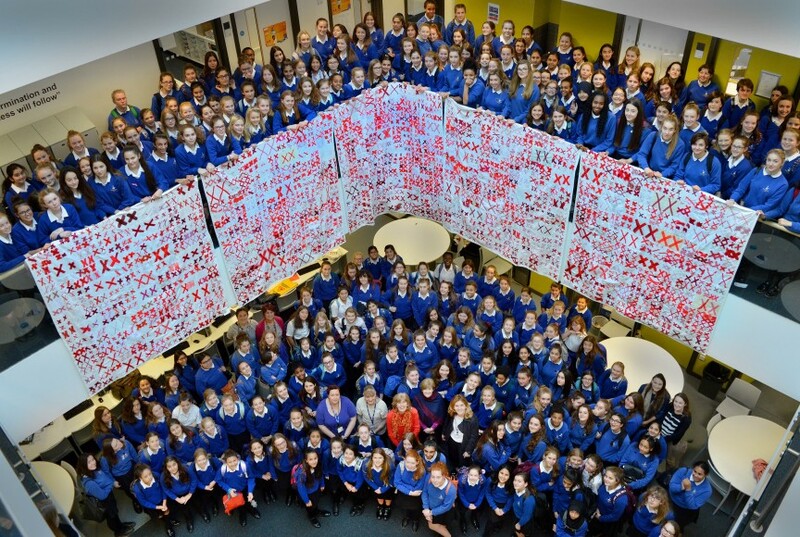 Mrs Davies is extremely proud of the efforts of students and staff at all three schools who embraced this fabulous community project and who have exceeded her original target of creating 1000 blocks as there are over 1500 in the five finished quilts. Special thanks also go to the amazing group of parents and staff who came to Waldegrave to sew all the blocks together. The blocks have been stitched into quilts to mark National Holocaust Memorial Day. After being on display in Rochester Cathedral for the past six weeks, they are now in St John's Church, Notting Hill. If you would like to go and see them, they will be there until 10 May along with many others. The project was shown recently on the BBC SOUTH EAST NEWS https://vimeo.com/243350339.